Jakarta, February 25th 2013 – Archipelago International opened its first trendy select service favehotel in Kalimantan, the favehotel MT Haryono Balikpapan. The new “fave” enjoys a privileged location on Jalan MT Haryono with close proximity to the central business district and Balikpapan’s Sepinggan airport. With 112 fun, fresh and friendly rooms, the new fave aims to bring edgy design and unprecedented levels of service to Balikpapan’s budget hotel market affording facilities and amenities usually associated with more high end hotels such as an attractive and contemporary hotel lobby, ample of parking space and an eclectic café serving complimentary breakfast. Guest rooms are equipped with 32 inch LED televisions, top of the line beds with quality cotton bed linens and duvets, free and “truly” high speed WiFi and a complete set of complimentary in room amenities such as fluffy cotton towels, bathroom amenities, individual controlled air-conditioning and save deposit boxes. Archipelago’s Vice President of Sales & Marketing, Mr. Norbert Vas, said: “Due to Indonesia’s budding economy and changing customer taste demand for quality budget hotels is on the raise. There are now 17 faves in Indonesia and Malaysia which are consistently fully booked and enjoy tremendous on line popularity with more than half a million bookings coming via fave’s accolade wining website last year. 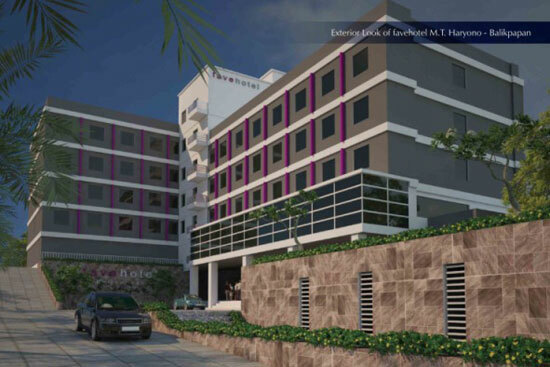 We are confident that the favehotel MT Haryono - Balikpapan, with its trademark design and service, will be equally well-liked”. favehotels currently operates 4 hotels in Jakarta, 5 in Bali, 2 in Bandung and Solo and 1 each in Balikpapan, Langkawi, Surabaya and Yogyakarta and has a large development pipeline in Indonesia, Malaysia and the Philippines. favehotels aims to become Indonesia’s best in class and most consistent budget hotel chain promising uncompromising standards for cleanliness and safety and a network covering the entire archipelago. The group has announced plans to open close to 30 new hotels within the coming 2 years. Archipelago International (formerly known as Aston International) is one of Indonesia’s leading hotel operators with an underlying portfolio of more than 60 hotels and 12.000 rooms and a development pipeline exceeding 80 properties in Indonesia, the Philippines and Malaysia. Archipelago managed Hotels operate under the hotel brands Grand Aston, Aston, Aston City, Alana, Harper, Quest, favehotels, NEO and Kamuela ranging from ultra luxurious private pool villas to serviced apartments and select service economy class hotels, thus offering Indonesia’s vastest and most comprehensive hotel network.